I got nostalgic about teletext at Block Party 2016: The Teletext-Digi Festival. This took place at the Centre for Computing History in Cambridge, and I looked at some of the old computers there and played a few games, such as The Hitchhikers' Guide to the Galaxy text adventure. I bumped into some of the demosceners there, as well as triffidfarm and fellow Stuart N Hardy fan, AwakeInBeds! 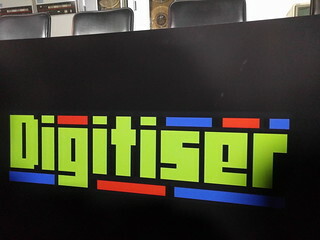 I listened to Digitiser celebrities talk - Mr Biffo, Mr Hairs, Violet Berlin, Mr T, etc! There was an excellent funny video by Mr Biffo, and there was also a rather strange quiz that happened. I drank vimto cider! I laughed at all the old jokes over again. It was an excellent day. I went on a tube walk from Queensway to Lancaster Gate. We peered at the elves on the Elfin Oak, and stared at the false façades at Leinster Gardens. deathboy and I had dinner at Ichiryu Udon and I ate kakiage and aubergine tempura, spring onion, wakame seaweed in miso based soup, with matcha green udon. I also ate tiramisu truffle mochi, and drank some sweet potato Shōchū. I visited the V&A with my mum and brother, and we celebrated my mum's birthday, and saw (and listened to) the You Say You Want a Revolution? Records and Rebels 1966-1970 exhibition, which was interesting, and a bit of a nostalgia trip for my mum. I visited the KitKat Chocolatory with deathboy and bought three kinds of KitKat: Raspberry, rose and hibiscus; butterscotch, pretzel and pecan; and rich cherry bakewell tart. I went on holiday to Torquay. I visited Plymouth and climbed up a lighthouse (Smeaton's Tower). I took a ride on the steam train from Paignton to Kingswear, then on the ferry across to Dartmouth, then a pleasant boat ride up the River Dart, where I saw Agatha Christie's house and Dartmouth Castle. I saw pretty coloured houses at Kingswear, wandered around Dartmouth, ate an ice-cream sundae and visited the Newcomen Engine house and saw the world's oldest surviving steam engine. I walked up the pier in Paignton and played air hockey. I watched the waves for a while. I played DDR in an arcade and danced to MC Hammer and Vanilla Ice. I went on the ferris wheel in Torquay and admired the views. One morning, I saw a beautiful sunrise over the sea in Torquay. I played on the swing in the birdcage at King's Cross, then visited Nottingham and learnt about how to influence people. I wondered if I should take up RPG, so that I would also have stories of dragons and armies I need to influence. grandedgemaster and I visited Milk Train and I ate matcha ice cream with a candyfloss cloud around it. We wandered around the Barbican, and walked behind pretend sand dunes and warmed our hands on a fake fire and listened to a shoe that sings. We stared at a wooden spoon and listened to a story about what happened at a rather weird restaurant. I played some drums and only much later realised that the drum playing was being broadcast above a racing track. We listened to a goat quoting Spaceballs. I made a goat speak my words. I watched a weird video about a depressed hypnotist with a noisy neighbour and wondered if I was being hypnotised. I stared up at the fake fire on the roof and pressed buttons on the vending machine, because it must be art. I found another singing shoe and listened to that too. We visited the Museum of London and the Museum of Lost Sounds and listened to objects that speak, such as a teapot. I listened to industrial music in the smallest pub in London, and read the blurb about Test Department, Cabaret Voltaire, 23 Skidoo, Millennium Mills and so on. I watched Sarah Angliss and Stephen Hiscock play the theremin and the Ealing Feeder and there was also a head that talked. I listened to jazz briefly. I punched holes in paper and ran the paper through a music box. I read about punks, and looked at old photos and descriptions from that era, and bits of related clothing. I saw a sun dog and then later, pretty pink skies. I went to the monthly Enlightened social and it was great to see people there! I completed the Brunel banner, half one night at a meet, and the second half at the weekend, and I remember walking on the beach at Wapping then. One Saturday, I did the Amazing Frog Banner and walked 22.6 miles that day. I completed a small banner in Plymouth, and another small banner in Nottingham. I did the Roman Londinium banner, which took us to bits of the London wall. London was so foggy that morning that I was unable to see the tops of buildings due to the fog. I got my first onyx badge, for owning a portal for more than 150 days!